The Museum of Fine Arts will be moved to Auberge d’Italie after all, the government confirmed yesterday, just three days ahead of a planned protest against its earlier decision not to relocate. “The Tourism Ministry confirms that, in effect, the Auberge d’Italie will house the National Museum of Fine Arts,” a ministry spokesman said. The previous government had planned to move the museum from Admiralty House in South Street to the more prominent Auberge d’Italie in Merchants Street, which houses the Tourism Ministry. Artists reacted with fury this month when it emerged the move would not go ahead as planned, as Admiralty House was not big enough to cater for the tourism officials currently based at the Auberge d’Italie. Strangely, the spokesman yesterday denied that the ministry had ever planned to halt the relocation. This was news to almost 200 people who had indicated on Facebook that they planned to attend a march in Valletta on Saturday against the government’s resistance to relocating. 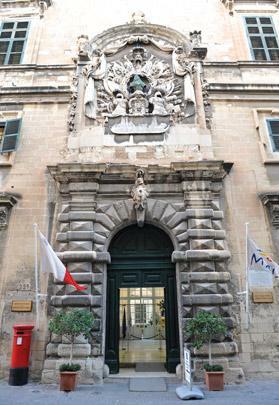 Government spokespeople have been quoted by several media organisations this month, including Times of Malta, saying the relocation plans had been halted. Tourism Minister Karmenu Vella and Culture Secretary Jose Herrera jointly announced last week that the government was considering alternative sites for the arts museum. In Parliament last Saturday, Dr Herrera said they were still searching for a suitable location. Despite the government confirming yesterday that the arts museum will now definitely move to Auberge d’ Italie, protest organisers were reluctant to call off their demonstration just yet. Artist Raphael Vella, one of the organisers, said he had no comment to make “at this stage”. “Let’s see how things develop,” he said, in reference to the fact the government had yet to make an official announcement or release concrete details of its new plans. The government spokesman said suitable premises for the Tourism Ministry, the Malta Tourism Authority and the Office of the Permanent Secretary had yet to be identified. They will definitely not be moving to Admiralty House, “as logistically that building and the adjoining building cannot house all the staff presently at the auberge,” the spokesman added. “What some may not appreciate is that low grade culture in the country is often an indicator of other things, such as the quality of the workforce and the quality of life,” Mr Gatt said.